It should be great. It is not. It starts marvellously; I’ve yet to read anyone who is as good as Crispin in building up an environment through a series of unrelated vignettes and asides that you then suddenly realise have perfectly filled out the world you’re reading about. It’s essentially a disorganised cadre of cases – a ‘non-doing’ pig, an amorous drinker, a crime fiction author disposing of an imaginary corpse, a family of decorators, etc – but it supports the loopier streak of Crispin’s writing that can then casually drop in a vicious poisoning without it striking a dissonant note. Fen’s electioneering, too, is wittily covered at first, highlighting his tendency to act in haste and repent at tortuous leisure. And then…well, then you find yourself halfway through an already short book and you realise that the plot is slowing down, that the chapters are filled with less and less relevant detail, and it occurs to you that you could probably skip to the end and discover the culprit without missing too much (you can, incidentally). The electioneering rapidly starts to gall – and I’m really not sure how this happens, as Crispin has a sharp and unforgiving turn of phrase that should find the ideal fit in the hypocrisy of politics – and the crime seam ends up relegated to about third-tier importance, which becomes a problem when you realise there is no first tier. Given the inevitable references to classic literature that pepper his books, I’ve frequently likened Crispin to Michael Innes except that Crispin is funny and readable. Here, he might as well be Michael Innes. You get a better sense of Fen’s ebullient character than in, say, Swan Song, but Swan Song is a superior book in all other regards. To take one example, I’m far less bothered by the lack of an impossible crime – the previous books all featured at least one instance of such – than I am by Crispin’s insistence (through his characters) that one particular aspect is impossible when it plainly isn’t; it feels like he’s trying to convince us that this thread of his novels has been maintained by simply dragging the wool down over our open eyes. The previous book in this series – Love Lies Bleeding – suffered from an overlong and underwhelming first half that set up a barnstorming second, and here that’s reversed, with no amount of bluffing it out likely to convince me otherwise! Now, there’s enough displeasure and discord in the world as it is – the threat posed by ISIS, spiralling public sector cuts, Celebrity Big Brother being back on TV – without me adding to it with a negative review. Class being permanent, this is a textbook dip in form that’s easily forgiven because of the quality elsewhere (his third novel, The Moving Toyshop, is one of the most boundlessly, effervescently creative detective novels ever written). As a place to start, however, it’s not recommended. Only completists need apply. I remember really enjoying this book when I read it… but having read several hundred books in between I can’t remember why! May have to have a reread and figure out why I liked it. Have you read many Edmund Crispins? This is the sixth of Crispin’s novels I’ve read, and I’ve also done his two short story collections (Fen Country and Beware of Trains). Everything else has been at least good, so this is definitely an outlier, and there’s probably enough to enjoy here if you’re in a forgiving mood so it’s not a book I’d be amazed to learn someone found enjoyable. I find my patience wears thinner the more I read, because time spent reading something with obvious and avoidable faults is time that could be spent potentially discovering something wonderful – only so much time and so many books left, after all! I don’t think I was as much of a fan of Crispin’s short stories or his novel Glimpses of the Moon. The Moving Toyshop though is a brilliantly conceived idea for a detective novel. I read most of Crispin’s work when I began reading crime fiction in a serious way so I don’t know whether my opinions of his work would change if I read him again now. I do agree with though on Michael Innes. He has never been a particular favourite of mine and I think the only one I properly enjoyed was What Happened At Hazelwood (1946), as I enjoyed the different narrative point of views. It doesn’t feature Inspector Appleby. Crispin’s short stories are quite different from the novels, for sure, but I liked them possibly because of this rather than in spite of it. It was great to see how focussed he could be on a core idea for only a few pages given how sprawling his novel plotting tends to be, but anyone looking for the level of wit or charm of the books is going to be disappointed, I agree. And I have struggled through as much Innes as one lifetime can bear, the same as with Nicholas Blake, and I’m onto other things now, but it’s nice to know there may be one worth checking out if I ever change my mind in future, so thank-you. I’ve tried Innes and Blake and I have to agree with you. Actually I find Blake’s nihilism rather distasteful. Yes I tend avoid Innes novels now, as like you said earlier, life is too short and there really are too many books to read. I quite like Nicholas Blake though. I think the first 5 novels are the strongest. After that I think the quality is rather mixed and not as high as the first quintet. Thanks for your review. 🙂 Having enjoyed the verbose and urbane wit of ‘Love Lies Bleeding’ – strangely, my favourite character was the bloodhound, not Gervase Fen – and I was tempted to purchase another Cripsin novel. I am glad that I got hold of ‘Swan Song’ instead of ‘Buried for Pleasure’. 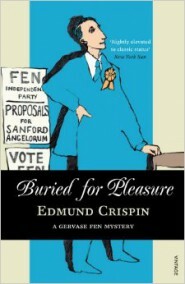 Buried for Pleasure is probably a fine book on its own merits, but it’s a poor Crispin. Swan Song has even less of Fen’s charatcer (there are two wonderful skits of pure Fen, but the rest is rather more straight detection). If you enjoy that one then any of the previous three will be your cup of tea, but The Moving Toyshop is for me the crowning achievement of his writing. Crispin’s not quite in Queen’s league of puzzling – very few are – but there’s always plenty to enjoy. Mystified that …Pleasure would frequently be considered better than …Toyshop, though; people are weird.